William (Bill) Watson Muir WATSON was born 24 August 1892 at Mount Oliphant Farm, Ayr, Ayrshire, Scotland to tenant farmers Thomas WATSON and his wife Jane (MUIR) WATSON. Bill, the fourth child and third son born to Thomas and Jane, was the last of their children to be born at Mount Oliphant Farm. Sometime between 1892 and 1895 the family left Mount Oliphant in search of a better living, a search that would lead them to seven farms throughout Scotland before the family immigrated to Canada in 1910. At Bill’s birth his name was registered as ‘William Watson Muir Watson’, although in later years Bill sensibly eliminated the redundant ‘Watson’ as a middle name. No explanation has ever been found for the extra ‘Watson’, perhaps the registrar was hard of hearing, or had partaken too much of Robbie Burns favourite spirit. As were all the Watson children, Bill would have been expected to work on the farms the family lived on, as well as attend school. In the 1901 census William (as he was called on official documents) was an 8 year old ‘scholar’, the normal term for school children in the census records of the time. In 1906 when Bill was 14, his 17 year old brother Jim [James Muir WATSON] left home and immigrated to Canada. Bill wanted to follow him and did so three years later. After he completed school, Bill sailed from Glasgow on the ship “S. S. Hesperian” and arrived in Quebec City on 19 July 1909. Passenger records show that he still used his full legal name as the ship’s register listed him as ‘Wm. W. M. Watson, 17′, His destination was Rapid City, Manitoba. Bill worked as a farm labourer in Manitoba for about a year until the rest of his family immigrated in 1910, when he moved to the Ellisboro area of Saskatchewan. 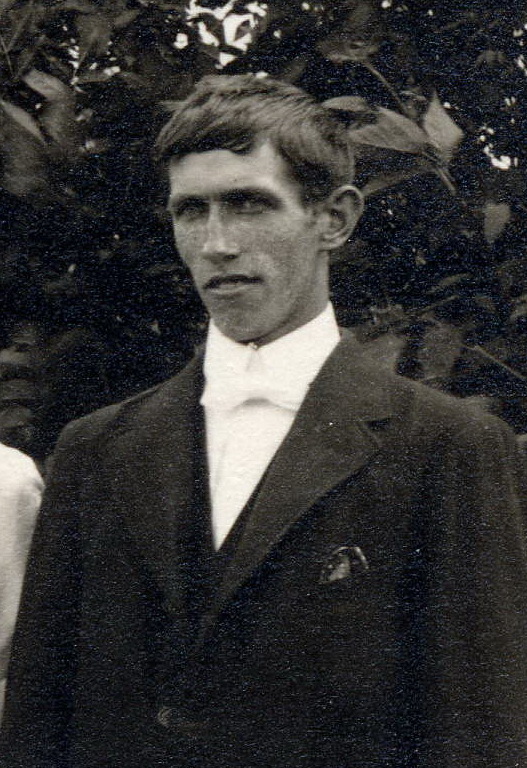 He was with the rest of the family on 10 June 1914 when his brother Jim married Agnes (Nancy) Elizabeth ACTON. [see post 29 April 2012 for photograph of Jim and Agnes’ wedding]. Two months later, in August 1914, WWI broke out and on 14 December 1914 in Winnipeg, Bill enlisted. 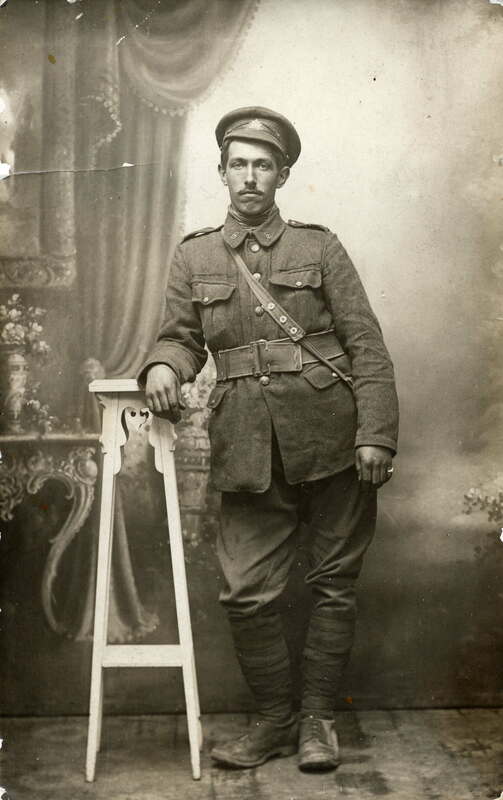 He served with the Canadian army (10th Canadian Infantry Battalion) in France from 1914 until the end of the war in 1919 and was involved in some of the bloodiest battles of the war. He rarely, if ever, talked about his horrific experiences in the trenches. Amazingly, he lived through the experience without suffering any physical wound or injury. His military file gave a physical description of Bill: 5 foot 7 ½ inches tall, grey eyes, dark brown hair. He weighed 140 pounds when he returned from the war. After he was demobilized in 1919 he returned to farm in the Lemberg area. “A social evening was held at the home of Mrs. S. ACTON [Janet WALKER married to Samuel ACTON]on Tuesday, July 22. The objective was to present each of the following soldiers with gold watches: Pte. W. M. WATSON, Pte. Fred OBLEMAN, Pte. Tobert CLARKE; Gnr [gunner] Neil BONGARD, Gnr. R. A. ACTON, Gnr. H. BANTRUM; Trpe. William BARTON, Trpe. Alex WATSON. On 15 October 1940 Bill married Sarah May (May) ACTON. Mae was the widow of Bill`s younger brother Alex. 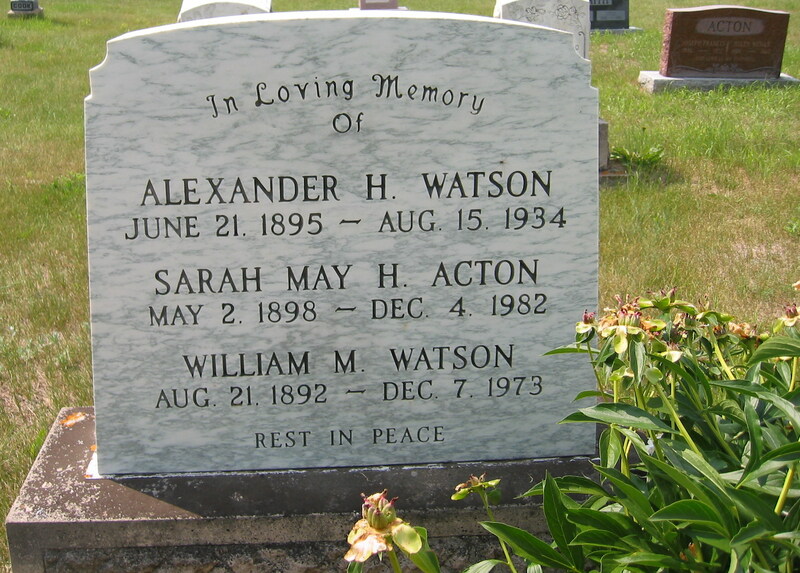 (See post 19 May 2012 on Alexander Hunter WATSON). Bill and Mae had one son. Bill and Mae had a blended family as Mae`s three children Janet, [living son] and Margaret, from her marriage to Alex also lived and grew up with them. Bill and Mae lived and farmed in the Lemberg area. Bill died on 7 December 1973, and Mae on 4 December 1982; they are both buried in the Ellisboro Cemetery in the Qu`Appelle Valley.